Home - Friends of Little Salt Spring, Inc.
and role in defining North Port and Sarasota County. "With the donation of Little Salt Spring from the University of Miami to Sarasota County your support for the ecological and archaeological site is more important than ever. The residents of Sarasota County and concerned people elsewhere need to convey how important the site is to us and your $10.00 membership to the Friends of Little Salt Spring is one big way to show your support. Sarasota County has demonstrated good stewardship of sensitive lands in the past but this property offers opportunities that the County Staff have not encountered before and will need our help to determine the best use of this one of a kind site. We need to approach decisions that affect the entire 112 acre property with caution due to the intact yet fragile nature of the ecosystem that exists at the site and the connected Myakkahatchee Creek corridor." This video is part of the Question and Answers session that occurred during the 2nd half of the Ancient Waters Community Forum . The Ancient Waters Community Forum was held on January 11th from 10am-2pm at the Morgan Family Community Center in North Port. Experts from various fields of study participated in an academic panel followed by a public Q&A. 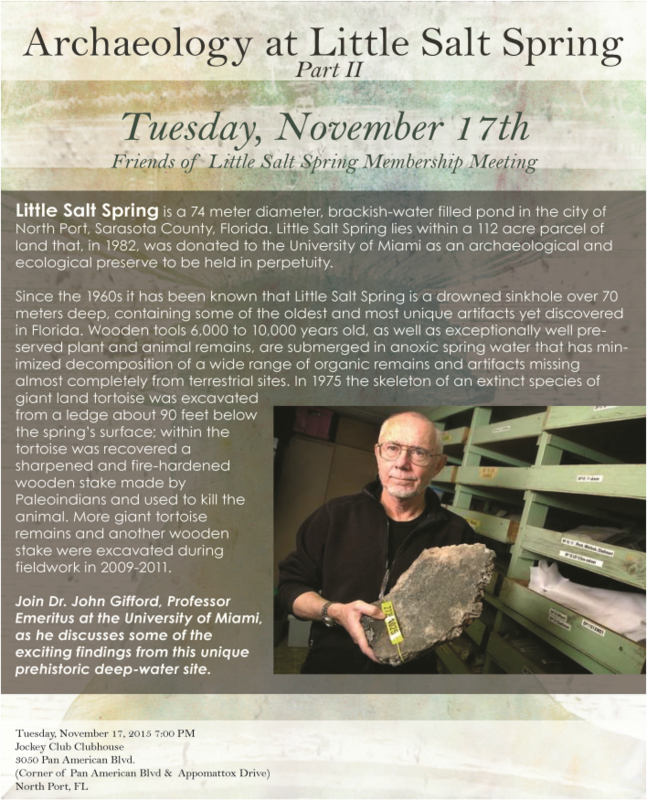 There is so much to learn about Warm Mineral Springs and Little Salt Spring, join us for the discussion and exploration of these significant sites. 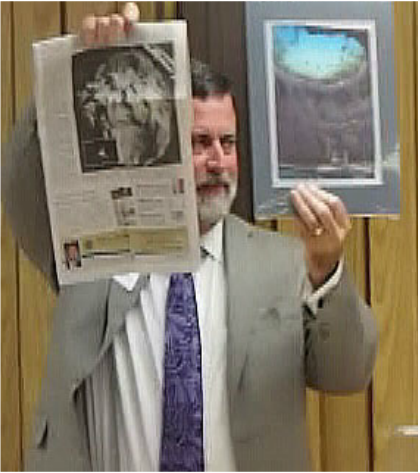 Additional information can be found on Facebook, Ancient Waters Foundation. FLSS Inc. was formed by a handful of interested local North Port residents early in 2012 and has grown today into a membership of several hundred. The Friends of Little Salt Spring Inc. recognize the cultural and natural significance of Little Salt Spring and see the outstanding potential of the site and the surrounding area. Little Salt Spring Archaeological and Ecological Preserve is a 112-acre parcel of land located in south Sarasota County in the City of North Port. The site contains a 260-foot wide by 250-foot deep sinkhole where evidence of Florida's earliest inhabitants has been found in the sediments of the 40-foot deep basin and the 90-foot ledge of the spring. FLSS Inc. welcomes members from around the region, around the USA and around the world. There are four Membership Categories. Individual Membership for One Year is $10, Additional Family Members are $5 each. Business Membership is $50 and Corporate Membership is $100. During this year of transition, the main goal of FLSS is Outreach to build awareness of LSS and the importance of saving it.